The first record of any borough owned fire apparatus dates back to June 13, 1855 when an entry in the councils minute book mentions about a motion to repair the “Huron” fire engine (hand or horse drawn) for $30.00 with the work being done by Henry Werntz for the Pine Grove Hose Company. The citizens of the borough petitioned for the purchase of a new fire engine in October of 1864. It was purchased from a Mr. Kurtz and was delivered on March 03, 1865. In 1893 a hose cart with 350 feet of hose was purchased from the Bosch Company in Harrisburg, PA and was delivered at the cost of $680.00. Also in 1893 Mr. Ed Keiffer was contracted to build a firehouse shed at a cost of $156.00. In October 1893 Mr. Sutton attended a council meeting and informed the council that he and a lot of good men wanted to form an official fire company. He and the men were granted permission to do so. Sixteen men were approved to be firefighters but the membership was not to exceed twenty men. A fire bell was erected in 1894 on a borough lot near by the hose cart shed. The bell was also used for special occasions such as New Years Eve and the end of the war. 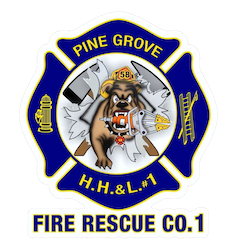 The Pine Grove Hose Company became officially chartered in 1895 with the name changing to the Pine Grove Hose, Hook and Ladder Fire Company No. 1. July of 1896 a contract was awarded to P. S. Shollenberger to construct a two story building on Mifflin Street to house the fire company, a lock up and a council meeting room for a cost of $2,789.00. The council would meet on the second floor and the fire engine and equipment would be kept on the first floor. If there were any firefighters up stairs when the alarm would ring they would use the slide pole to get the first floor more quickly. Mr. Morris Hikes an original member of the company was a “Squire” and waited to hear the bell to ring to notify him that there was a quorum and he would go to the firehouse to conduct the regular monthly meeting. Hobo’s that were traveling along the railroad tracks were numerous and a certain two would be fed by Mrs. Annie Moyer Dress on Carbon Street and then they would head to the firehouse where they were allowed to stay in the lock up overnight. The lock up and bar room were housed downstairs. By 1912 The membership had increased to forty men and in five years they were permitted to have the membership up to sixty-five men. 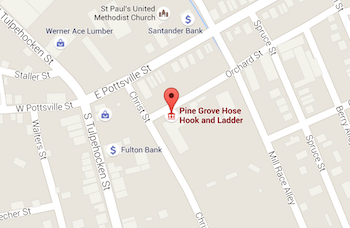 In 1914 another hose cart with fifty feet of hose was purchased and placed in the new annex of the borough. 277 people signed a petition 1916 and presented it to council to furnish the fire company with a motorized fire truck with a pump for modern fire protection for a growing borough. No action was taken. An Air Warden approached the company in February 1942 to ask if they could supply men at the observation tower on High Street from Thursdays 5:00 p.m. till Fridays 8:00 a.m. The company held its first annual banquet February 21, 1942 at 6:30 p.m. The company purchased the Brick Yard for $487.75 in November 1943. This is where the firehouse sits today. A new 1947 500 gallon per minute pumper made buy Mack was purchased and delivered for a price of $8,493.18. Later this was sold to Mr. James Mahoney from Lebanon, Pa for $5000.00. February 05, 1948 at 11:10 a.m. fire struck the firehouse. The trucks were saved but all of the records and everything else was destroyed. They needed to replace the hoses, nozzles and some other equipment after the fire. It cost $1,500.00. The kids were able to watch the fire from across the street from their classrooms. During the February meeting the membership agreed to rebuild and it was to be at the same location. The fire company provided the Little League Baseball with ground to build a field in 1952. At this time the company still provides the land for the Little League Association and the kids to play. 1966 a 1967 model Hahn/International was purchased with a 750 gallon per minute pump on it. It was delivered in 1967. In 1988 it was refurbished by Hahn and served the community till September 2000. At a regular monthly meeting in October 1970 it was approved to purchase a 1971 International Mini Pumper with a Welch pump. This was the first of its kind in the county. A 1974 Ford van was purchased for rescue tools and a personnel carrier. In 1979 a set of Hurst tolls were purchased and added to the van. It was the first in our area. A cascade system was purchased and put into service April of 1979. 1980 a Car Mar GMC 1500 gallon pumper/tanker was purchased in January 1981. In 1985 a Ford Econoline rescue was purchased. A larger vehicle was needed for the personnel and the rescue tools. Today this serves as a squad to carry extra equipment and personnel. The company decided in 1995 to build a new building that would allow us to up grade equipment. This also houses a larger engine room, larger kitchen, social quarters, banquet facilities, an office and a meeting that also is used for a classroom for training. In July 2000 a 2001 Pierce/International pumper/rescue with a 1500 gallon per minute pump, 30 gallon foam cell and seating for five was put into service September 2000. The company was able to raise enough money from the generous donations and support from our great community and surrounding area to pay it in full in July 2001. We have been volunteering our services since 1855. We are the sixth oldest company in Schuylkill County, PA.